View Poll Results: What sounds like the most Interesting feature? December 19th, 2009 (8:25 PM). Edited January 4th, 2010 by chrunch. Okay, this is my first hack! This is a hack of Firered. to get your first pokemon! What item could be inside that pokeball? What could they be doing here? It's the Pokemon Trade Center! Looks like you need Cut to enter MT. Sledge. None. I'm working solo on this. slowpoke, Squirtle, Chikorita, Treecko, Oddish, Torchic, Cyndaquil, vulpix. their pokemon. They might even have rare Pokemon! The more badges you get, The more trades are available! This operates alot like the Battle Frontier. This is a place where you come to play minigames. The more badges, the more minigames available! it. The minigame points can then be spent on an item or pokemon! December 19th, 2009 (9:00 PM). December 19th, 2009 (9:38 PM). The name took me a while to think of. I'm also thinking of a better story. December 20th, 2009 (8:23 AM). December 20th, 2009 (1:53 PM). I've improved the story and added the starters section. It's all on the first post. Expect screenshots for the next update! December 20th, 2009 (2:54 PM). Sure I'll make some userbars. Any specifications? December 20th, 2009 (8:13 PM). December 20th, 2009 (8:50 PM). ok,i'm sorry but this will not work,how are you POSSIBLY going to fit the starters in? there's only three pokemon to start with, and on all starter pokemon hacking tools only 3 slots, so please explain how to fit these in? December 20th, 2009 (9:06 PM). Edited December 21st, 2009 by chrunch. I've already scripted that event. You'll see in the alpha. I've finished everything in Tiny Town, the starting town. December 21st, 2009 (8:06 AM). What pokemon will your rival have? Would you like to be in a hacking team? Become a great hacker at the Chaos Productions! December 21st, 2009 (9:59 AM). December 21st, 2009 (10:30 AM). December 21st, 2009 (10:43 AM). this sounds EXACTLY like pokemon sienna. December 21st, 2009 (11:12 AM). December 21st, 2009 (3:32 PM). Edited December 21st, 2009 by chrunch. It's not perfect Because of Shellder(it's ice and water types), but Shellder is staying. Thanks for the offer, but I'm working solo on this, like I mentioned on the first post. December 22nd, 2009 (1:43 PM). Sorry for the double post...but I have an update, so I can! December 23rd, 2009 (3:19 PM). What could be inside that pokeball? So, I'm working on hinder city right now. And... TAUROS WISHES YOU A HAPPY CHRISTMAS! December 23rd, 2009 (3:43 PM). Your second screen could use a slight adjustment in the post above me could use some slight work. The ledge opening has a gap of one tile, which is kind of restictive - I'd suggest opening it up to a two or three tile width so the player doesn't feel restrained (General rule of thumb for mapping). There is a Pokemon inside every Pokeball. December 23rd, 2009 (7:31 PM). 1.Right then, I won't swich to a rombase. 2.I agree, I'll change that to a two tile gap. just to a dead end. And, the story isn't very good, I'm no good at making those. December 28th, 2009 (8:27 PM). Edited December 28th, 2009 by chrunch. I've expanded the alpha a bit so it isn't so small. December 28th, 2009 (8:30 PM). Location: I'm always living aren't I? 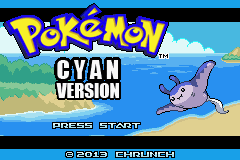 Hmm Crunch why not getting a rom base or something to make it look nicer or are you doing it purely FrLg tiles? December 28th, 2009 (8:38 PM). December 28th, 2009 (8:57 PM). December 29th, 2009 (5:34 PM). I'm actually doing all the work myself(Including scripting). December 29th, 2009 (5:47 PM). Personally, I don't like the way in which you have constructed the Gym in Hinder City. A nice large Gym which has sides of the same length does it for me :P. Does the mountain in the top-left have to be that one extra tile wider? If it doesn't, do you think you can replace the skinny tree with the sign and lengthen out the Gym a bit? The text in your third screenshot can be cleaned up a bit. Move the 'in' down one line so the red triangle can be seen clearly.